Look for a one-way valve (the black hole of espresso delight) on your coffee bags – this lets unwated gases out, keeping coffee fresher longer. Storing coffee beans demands a great ability to ignore most of the nonsense trotted out in the community about fridges, freezers and airtight containers. In essence, you want to keep your beans safe and happy until you are ready to consume them. Roasted coffee does not enjoy being exposed to heat, as that increases its urge to release its goodness too early, leading to stale coffee. Nor does it like being exposed to air (oxidisation spells the end of palatable coffee) or water (it spoils the beans too soon). Finally, time allows all these enemies to make advances, even in the best storage conditions, so consider a coffee clock is ticking the moment your beans have been roasted. Be that as it may, most discerning coffee lovers will actually find properly roasted and packed coffee can quite handsomely remain tasty for a good six months in the right bags and storage conditions. Yes, really fussy coffee drinkers will demand coffee roasted within the week before consumption with a whole gamut of personal theories on time between roasting and drinking. Some people swear by drinking just hours after roasting (even though most beans will still be too volatile), to 2-3 days, to 8-12 days, and every shade in between. In fact, you could write a book called the 50 Shades Of Brown and dedicate it to people’s preferences for coffee roasting to drinking time. However, at the sane and realistic end of the spectrum, you should find that the convenience of having coffee roasted and packed for you (and ground too if you don’t own a ‘proper grinder’) will meet and most likely surpass your coffee needs at home and in the office. So, with the enemies and quirks out the way, here are some tips for you for storing coffee. The first step in keeping coffee beans or ground coffee fresh is to make sure you buy your coffee in bags fitted with one-way valves. 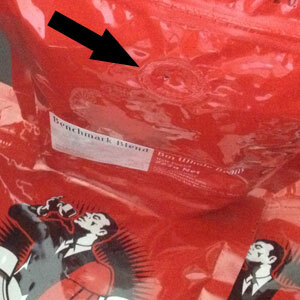 The picture, above, shows the little circle on the side of a Baristador Coffee bag that let air OUT but not IN. If your coffee does not come in that sort of package, avoid it. Coffee beans emit gases after roasting that need to escape and you need to be able to expel excess air after opening the bag, otherwise your coffee will ‘stale’ at the speed of light. Keep your coffee in a cool, dark cupboard or anywhere out of direct sunlight or out of reach of a direct heat source like a kettle, coffee machine, oven, stove, etc. Consume within a fortnight once you break the seal on the bag. If you cannot do that, your bags are too big, look for smaller bags. Did I mention Baristador Coffee comes in smaller, half pound bags for this express reason? Avoid freezing and refrigerating your beans because the frequent change in temperature causes condensation inside the packet and we have already mentioned that WATER and AIR are the two most evil things coffee will ever encounter. If your machine has a hopper in which you can store coffee beans at the ready so you just push a button and make coffee on demand, keep it close to empty, especially through summer. Coffee beans needs protection, not exposure to air and heat that a coffee machine offers. A good habit is to just top a few beans into the hopper each morning, enough for that day. Better still, grind separately on demand and use the part of your machine that takes preground coffee. I hope this helps you enjoy better coffee all year round, espcially if you order your Baristador Coffee online.